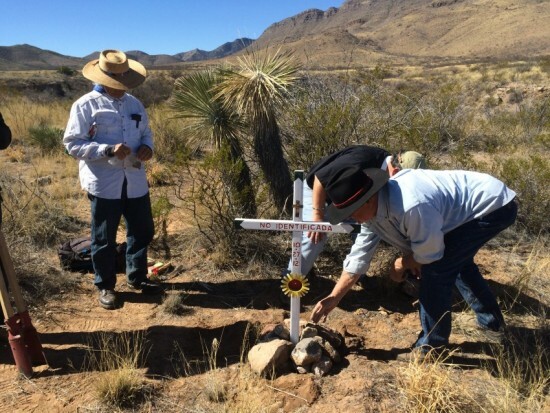 Travelers who perish in the deserts of the Mexican Arizona border are not forgotten. Join our treasured contributor, Peg Bowden as she searches for meaning in those lost going North or South on this well-traveled trail. 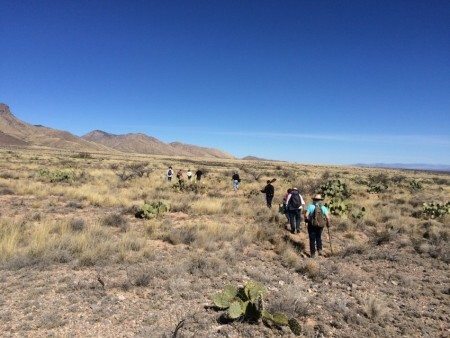 We are a motley crew of ten as we set out on a sunny February morning, walking north toward the Whetstone Mountains of Arizona. Our leader, Sister Judy, carries her cell phone and her eyes are glued to the GPS, keeping us on track. She is our tracking bloodhound, nose to the ground, and we are the trusting sheep, silently hoping she knows what she is doing. The sun and temperature are rising, and we don’t want to get lost. 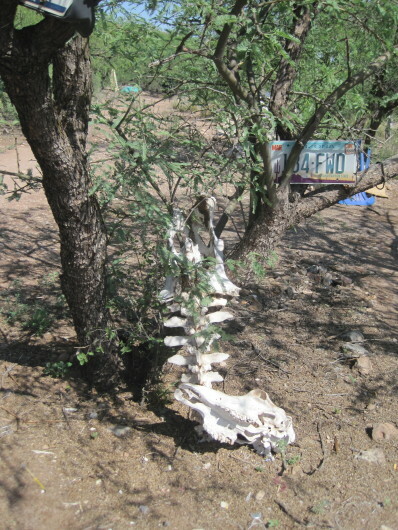 More than 2,000 human remains have been found in the Sonoran desert over the past 15 years. The actual number of bodies is much higher, as many of the lost will never be found. I think about the official policy of the US Armed Forces, and their “no soldier left behind” code of conduct. This action by our military always seems heroic and somehow holy to me. No soldier’s body will be left on a battlefield. We will find them and bring them home. It is a sacred rule. And yet here we are on this starkly beautiful desert landscape, where thousands of bodies have been left to rot, their bones torn asunder by the wild creatures of this land. Because they didn’t have the correct papers. It is a killing field. 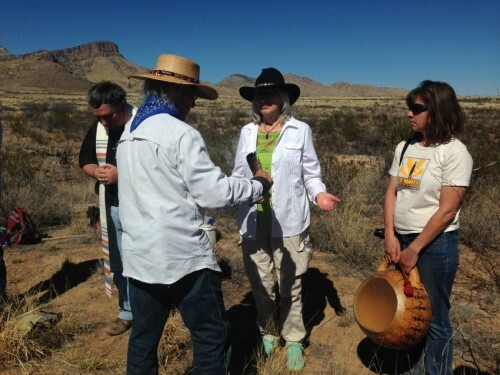 On this journey we are a group of many faiths, many beliefs: an Episcopal priest, a Yaqui holy man, two nuns, a few lapsed Catholics, a non-believer or two, and some social activists. 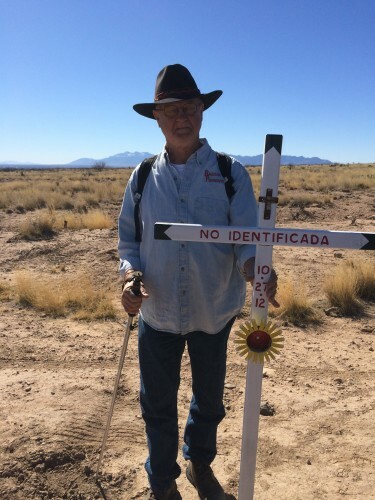 One man carries a cross he has created with the words, “No Identificada” carefully painted on the cross bar. A rusted tuna can painted a colorful yellow looks like a sunflower. The can was most likely dropped by a migrant. It is nailed to the pristine white cross. The tuna can is a talisman of spring. The mood is upbeat. We are on a mission. 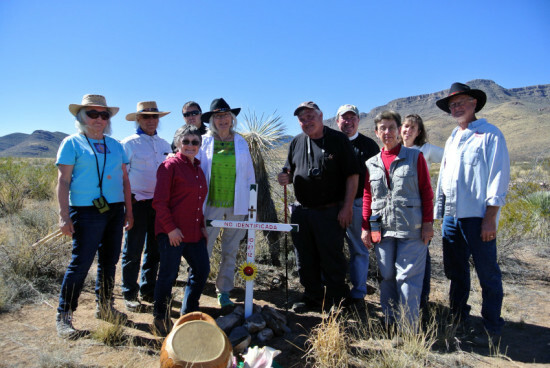 We are going to plant this beautiful cross in the desert and acknowledge that this unidentified woman had a life full of meaning, and it tragically ended here on this sacred spot. 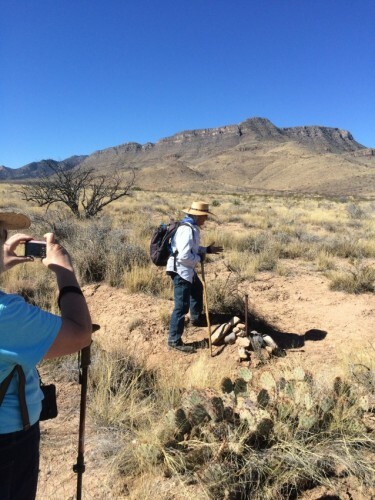 We trudge along through the dry grasses dodging cholla and prickly pear cactus. Theday is warming up, and I keep my eyes and ears attuned to rattlesnakes coming out of hibernation. 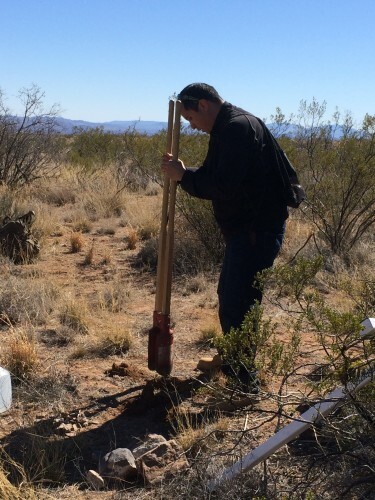 One man told me that when he rose from the desert floor, he saw the Border Patrol in the distance. The vision or angel or whomever it was by his side told him not to worry. When we reach the spot where the unknown woman died, we drop our backpacks and set to work. First digging a hole with a post-hole digger, we then collect small rocks and drop them into the cavity along with some cement and water. We carefully place the cross in the shallow pit of cement facing east toward the rising sun. Standing in a circle around this spot, Gabriel leads us in a simple, profound ceremony of remembrance and hope. He smudges each of us with the smoke of the sweet-smelling sage. We try to focus our thoughts on this moment, and as the blue smoke rises upward enveloping our bodies, we send our prayers to this woman. I have already silently named her the Woman of Whetstone. I try to imagine what she looked like. She was probably wearing jeans and ill-fitting shoes, and perhaps a jacket from one of the aid stations in Naco or Agua Prieta. Maybe I had handed this woman some shampoo and soap at el comedor in Nogales. We are less than a mile from Kartchner Caverns, and I wonder if this woman was trying to make it to the parking lot where there were people. You can see the trucks and cars moving along a highway from where we stand. There is civilization nearby. What was going on in her mind? The Woman of Whetstone was probably a mother trying to earn enough money for her family. She risked her life to come to this country so she could feed her kids. Dreaming of a steady salary from Burger King or a housekeeping job, she wanted a warm safe bed for her children and food on the table. I would bet my life on it. Gabriel leads us in a beautiful meditation to focus our intentions. First we face east; this is where the sun rises along with the birth of a new day and new life. Then we face south; this is where the sun warms the earth and seeds grow. This is where life unfolds and emerges. Next we turn to the west; here the sun sets and old age creeps upon us. Lastly we face the north, where our bodies become cold and life ceases. Here we move on to the next dimension. We raise our faces to the sky and gaze at the heavens; we kneel on the earth and hold the red desert dust. The moment was emotional and transcendent. I think we all felt the presence of the Woman of Whetstone beside us. She was our desert vision, and in a strange way, I felt invisible. No one intruded on our pilgrimage. There were no Border Patrol agents checking us out, no helicopters, no one. We had all entered a different reality out here. 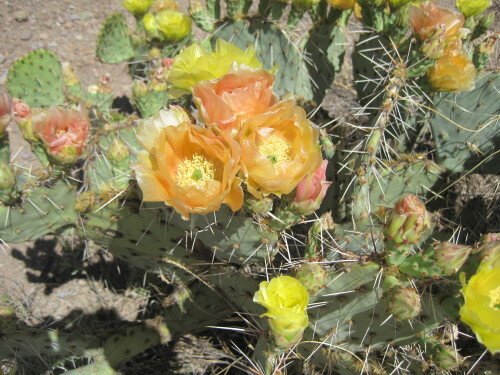 The desert will do that. Just when I felt a bit dizzy from the heat, a small breeze stirred and brought me back to this sacred place. It was the Woman of Whetstone. Hiking back to our cars, we were all silent. Our government has failed us; immigration reform has been a dream just beyond our grasp. But this unknown migrant woman taught us humanitarian compassion. She brought a group of ten strangers together in fellowship and mystery. She was not left behind. Peg Bowden has written a book, A Land of Hard Edges, available in most bookstores in southern Arizona, your local library, or Amazon.com. If you wish to receive regular postings to this blog, register in the Announcement List space in the right-hand column, and you are automatically on the email blog list.